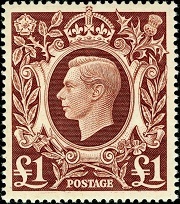 Definitive British stamps for King George VI first appeared at the beginning of 1937. 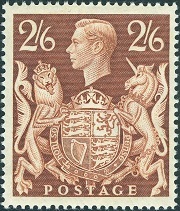 Albert Frederick Arthur George, the Duke of York, was acclaimed King George VI, following the abdication of his older brother, on December 11, 1936. He NEVER WANTED TO BE KING, but the role was involuntarily thrust upon him. With his perseverance against incredible personal obstacles and his dedication to his royal duties, he became one of the most beloved monarchs of the 20th Century. 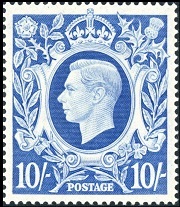 The definitive postage stamps of King George VI were a pleasant departure from the designs of earlier British monarchs. The designs were simple, yet elegant looking, and the stamps of this reign are favored by many stamp collectors around the World today. 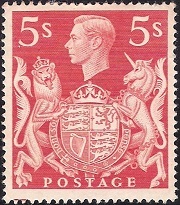 All of the definitive British stamps of King George VI have the following technical attributes in common. Perforation: Perforated 14 1/2 x 14. Watermark: WMK 259 (See above). The fifteen lower denomination definitive British stamps shown above were issued between 1937 and 1947. 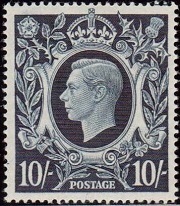 The attractive central designs of these stamps feature a crown above the left facing portrait of the king. 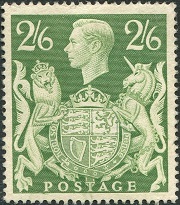 The portrait of the king is printed in a lighter shade than that of the background color, giving the portraits on these British stamps a "cameo-like" appearance. 1/2 P. (1937 - Sc. #235) - Deep Green. 1 P. (1937 - Sc. #236) - Scarlet. 1 1/2 P. (1937 - Sc. #237) - Red Brown. 2 P. (1938 - Sc. #238) - Orange. 2 1/2 P. (1937 - Sc. #239) - Bright Ultramarine. 3 P. (1938 - Sc. #240) - Dark Purple. 4 P. (1938 - Sc. #241) - Gray Green. 5 P. (1938 - Sc. #242) - Light Brown. 6 P. (1939 - Sc. #243) - Rose Lilac. 7 P. (1939 - Sc. #244) - Emerald. 8 P. (1939 - Sc. #245) - Bright Rose. 9 P. (1939 - Sc. #246) - Deep Olive Green. 10 P. (1939 - Sc. #247) - Royal Blue. 11 P. (1947 - Sc. #266) - Violet Brown. 1 S. (1939 - Sc. #248) - Brown. The 1/2 P. through the 2 1/2 P. denominations were also issued in coils and in booklets. Some of the denominations of this set exist part-perforated and imperforate, and as such, they are very rare. The six impressive looking high-denomination definitive British stamps shown above were issued between 1939 and 1948. 2 S. 6 P. (1939 - Sc. #249) - Chestnut. 2 S. 6 P. (1942 - Sc. #249A) - Yellow Green. 5 S. (1939 - Sc. #250) - Dull Red. 10 S. (1939 - Sc. #251) - Indigo. 10 S. (1942 - Sc. #251A) - Ultramarine. £ 1 (1948 - Sc. #275) - Red Brown. Between 1941 and 1942, the 1/2 P. through 3 P. denominations were re-issued in lighter colors than those of the original 1937 and 1938 printings. Unfortunately, the original cameo effect is not evident on these re-issues. They are all shown above. 1/2 P. (1941 - Sc. #258) - Green. 1 P. (1941 - Sc. #259) - Vermilion. 1 1/2 P. (1942 - Sc. #260) - Light Red Brown. 2 P. (1941 - Sc. #261) - Bright Orange. 2 1/2 P. (1941 - Sc. #262) - Ultramarine. 3 P. (1941 - Sc. #263) - Violet. The 1/2 P. through the 2 1/2 P. denominations were also issued in booklets, and the 1 P. through the 2 1/2 P. denominations were also issued in coils. Some very rare varieties, including imperforates and tête-bêche pairs, of these stamps, also exist. Between 1950 and 1951, the 1/2 P., 1 P., 1 1/2 P., 2 P., 2 1/2 P., and 4 P. denominations were all re-issued in new colors. They are all shown above. 1/2 P. (1951 - Sc. #280) - Light Orange. 1 P. (1951 - Sc. #281) - Ultramarine. 1 1/2 P. (1951 - Sc. #282) - Green. 2 P. (1951 - Sc. #283) - Light Red Brown. 2 1/2 P. (1951 - Sc. #284) - Vermilion. 4 P. (1950 - Sc. #285) - Ultramarine. Some very rare varieties, including imperforates and tête-bêche pairs, of these stamps also exist. The great looking set of four pictorial high-denomination definitive stamps shown above were issued on May 3, 1951, as part of the Festival of Britain celebrations. The Scott catalog details and descriptions are as follows. 2 S. 6 P. (Sc. #286) - Painting of the H.M.S. Victory. 5 S. (Sc. #287) - White Cliffs of Dover. 10 S. (Sc. #288) - St. George Slaying the Dragon.